Want to know my simple formula for creating quick and easy sales that spit out thousands of dollars in under 2 weeks- starting WITHOUT your own product?! "Discover My Secret System For Creating On-The-Fly Sales That Rake In Thousands In Just Weeks! . . . No Experienced Needed!" Sleep Better At Night Knowing You Can Make Thousands Of Dollars Whenever You Want! How would you like to learn my exact formula for creating quick sales that bring in tons of traffic and produce thousands, sometimes tens of thousands of dollars in just a week?! I have been running speed sales for years that literally burst onto the scene and make tons of cash very quickly and very easily and I have it boiled down to a science! Once you have a system like this that you can use whenever you want, you can literally make money at will, just by following a few simple steps!! It's like your own money printing machine, And anybody can do this! You Can Make A Full Time Living Just Launching These Speed Sales Part Time! What if you were making an extra $1,000, or $2,000 or even $5,000 extra every month? What would you do with that money? Maybe you'd pay off some debt, or take more vacations. Maybe you'd save more and retire earlier. Maybe you need a new car or want to try a new expensive hobby that you haven't had the money for. Whatever your choice is, the extra money that can be made from a part time Internet business can be huge! It is easier then you think. Everybody has been making this whole concept seem much harder than it actually is! I'm here to simplify things for you! I have been launching different products and offers for years that have all made me easy money. Products that I did not create and that did not cost me a fortune to acquire. Nor did they take much time or expertise to setup and make profitable! I have used these types of sales that are done in 1 week to make upwards of $70,000 on some occasions! So what is a Speed Sale? A speed sale is simply a sale that you run that takes just a few days to set up, and is over with within a week or so. The whole thing can be done be started and ended within 2 weeks and can make you thousands of dollars if you have the right formula to make it work! This report literally is a connect the dots blueprint for setting these up and profiting from them quick! Times are tight right now and I'm sure you could use an extra surge of cash, right?.. And, you can duplicate this system for even more money making businesses! In fact, you could work one week per month, run a new sale each month, and make a full time living just off of your monthly speed sale! It's that powerful..
You Don't Need Your Own Products! - You don't have to be a writer or programmer, I will show you how to get your own products without those skills! You Don't Need Much Time To Start! - You can set this up quickly and easily! I have made it to where you use as little time as possible to set up these sales that will make you a fortune! You Don't Need Much Money! - You can do most of this for free! If not, it is still dirt cheap to do..
With this paint-by-numbers report, it couldn't be easier. 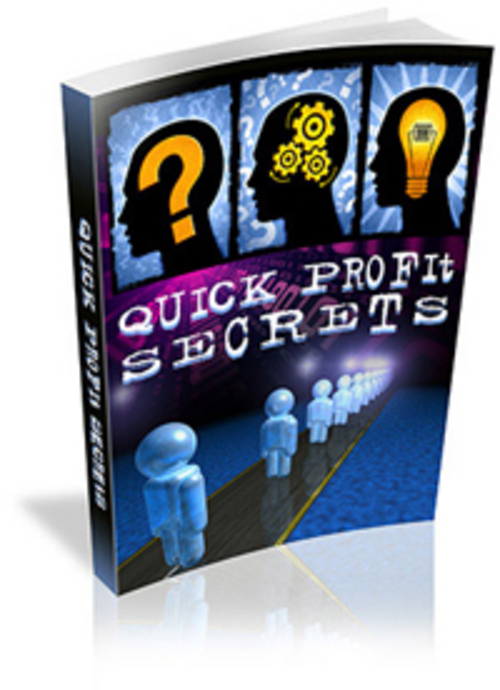 I'll let you in on all of those secrets and more inside 'Quick Profit Secrets' report! The Main Aspect That Makes These Sales Sell So Well! How You NEED To Limit Your Sale For A Huge Response! How To Build A List And A Membership (recurring income) With These Sales Incredibly Fast! How To Give Away 100 Of The Money And Still Make A Killing! How To Do Quick And Easy Research To See If Your Sale Will Make A Fortune! How To Duplicate Your Efforts To Maximize Profits! How To Get All The Content For Products That You Need Easy!